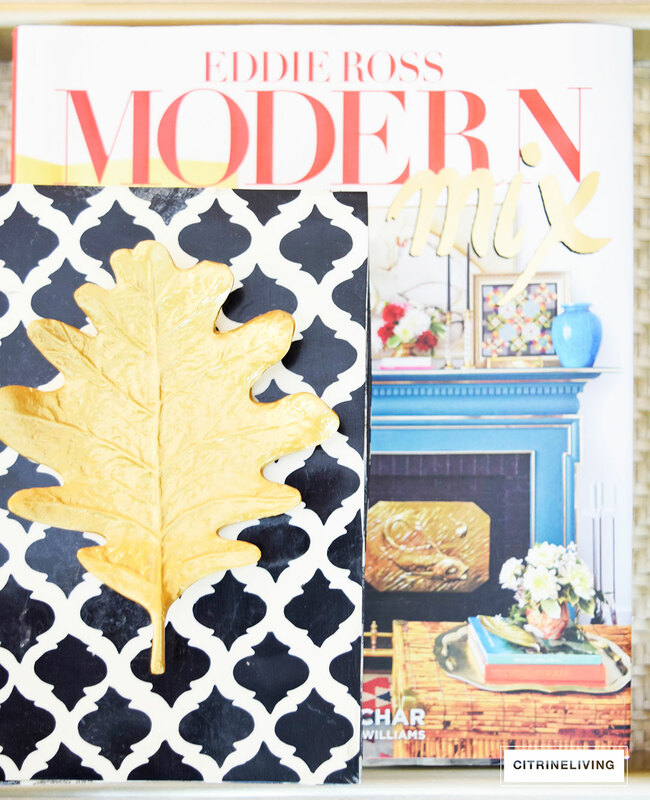 Welcome to my Fall home tour, if this is your first time visiting, welcome to CitrineLiving! 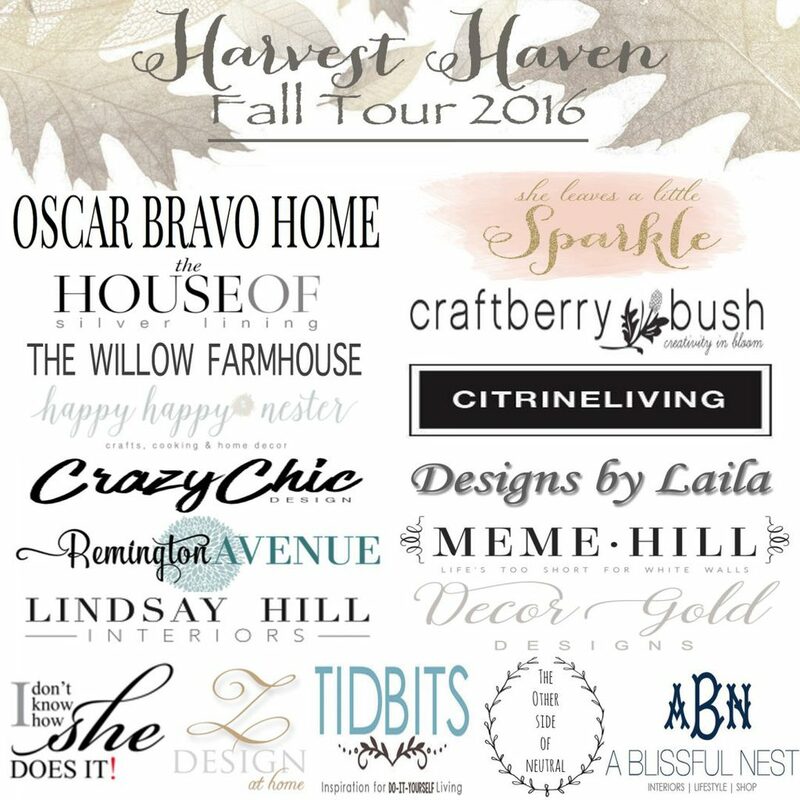 Thank you so much for joining us in the Harvest Haven Fall Tour 2016, hosted by Summer of She Leaves A Little Sparkle. 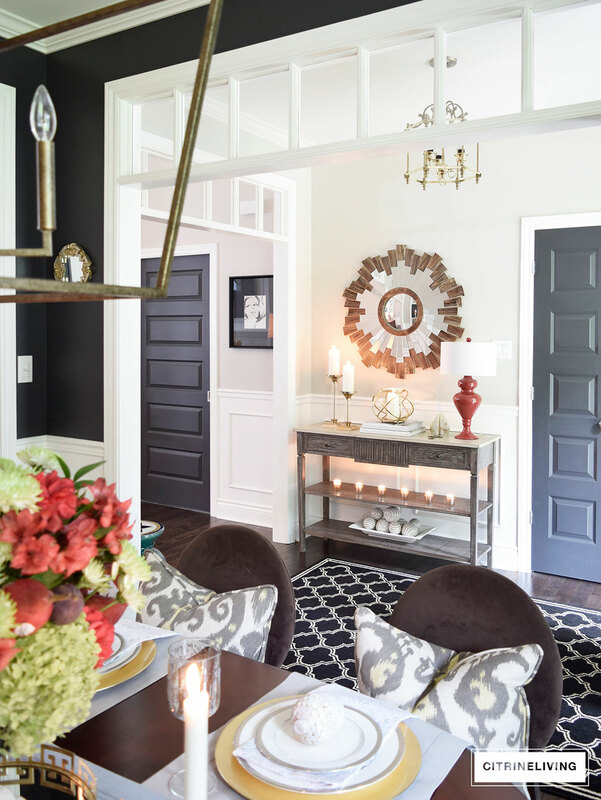 If you’re coming from Laila’s beautiful home of Designs By Laila, I’m thrilled to have you here! If you’ve been reading along with me for a while, then you may have already seen my Fall tour from last year – if not, you can have a peek here. My porch last year was rich with red mums and burgundy grasses. To change it up, I decided to keep the look more neutral this year, and use some grasses with just a hint of red. As with most of my seasonal decor, I keep it pretty simple. The past couple of years, I’ve used my metallic pumpkins and gourds tied together with mostly neutral elements. This year, I was challenged to find a way to use the same items in a different way. I also didn’t want to spend a fortune replacing it all. I wanted to keep the Fall theme to a minimum, even more so than last year. 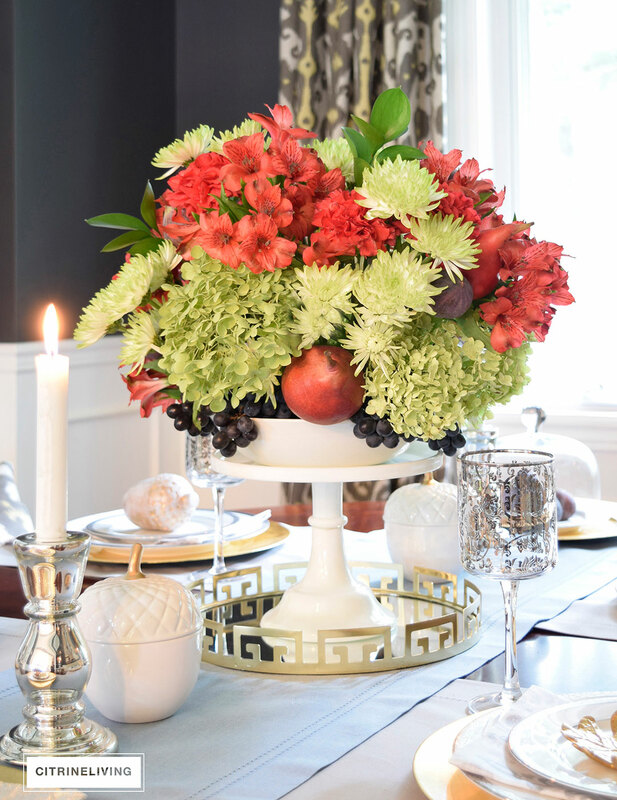 What I really wanted to do was bring in the essence of the season through color and texture. If you look closely in the above photo, some of those pumpkins are my mercury glass and resin ones from last year – I figured why not try them on the porch and see how they look?! They were mainly used in my Fall tablescapes, which you can see here and here. 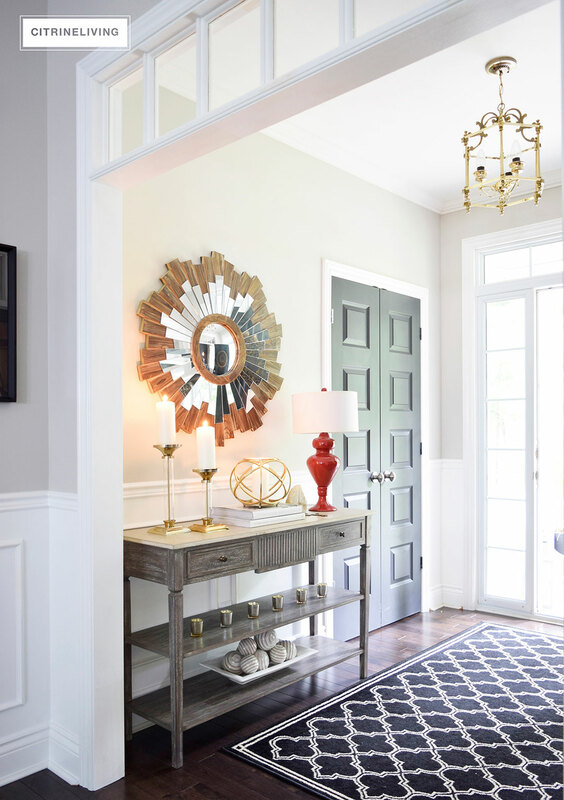 In the entryway, I kept it simple with a dose of color – this is one of my favorite lamps that I pulled out from storage, by Barbara Cosgrove. I’ve had it for quite a few years and I love it more each time I see it. 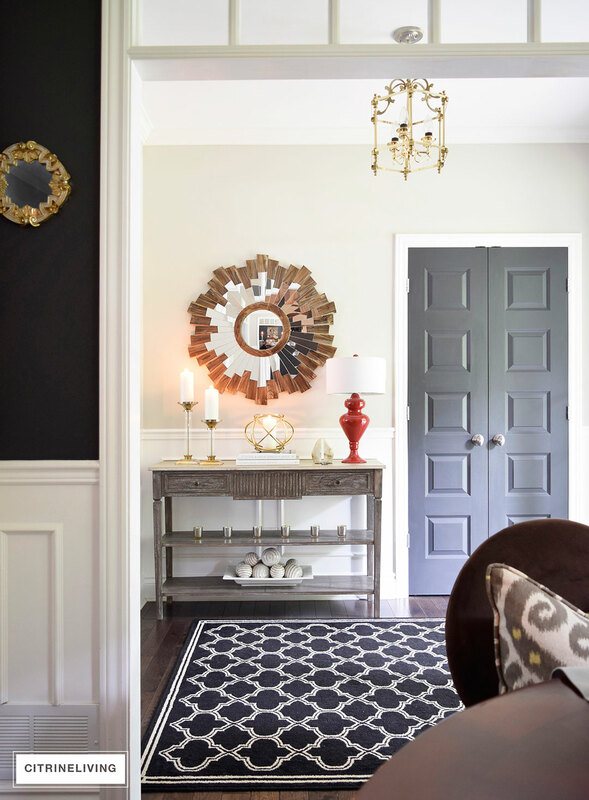 It was the perfect element to bring in a warm layer as you enter our home. 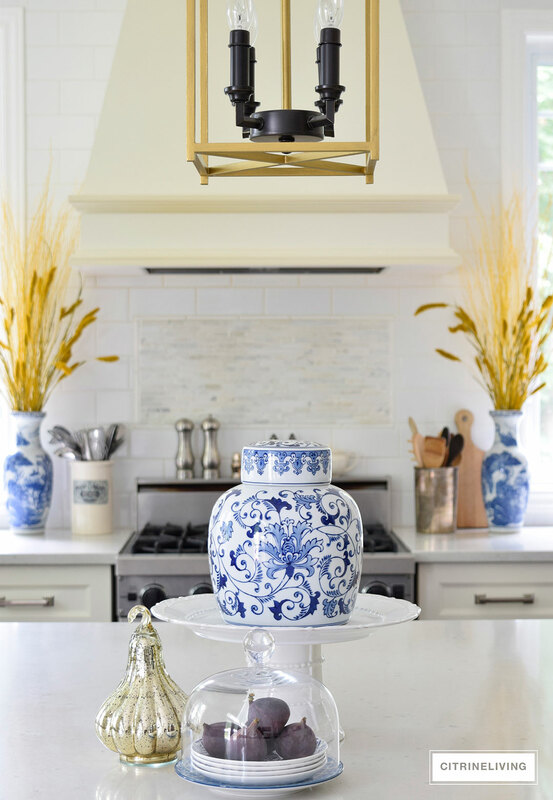 Together with the gold candlesticks, orb, and other neutral elements, it sets the stage for the rest of the decor. 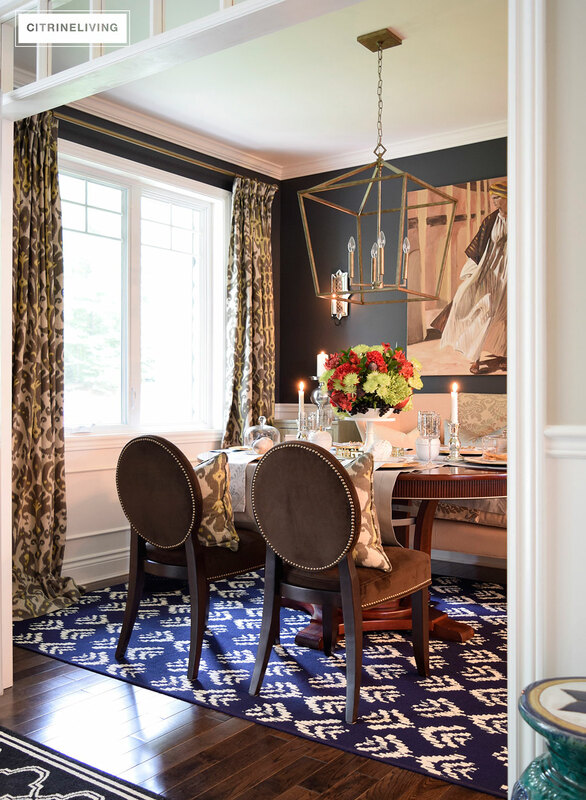 Let’s move over to the dining room, where you’ll get a heavy mix of pattern and texture. If you’re a new visitor, then you’ve probably never seen so much in one space! 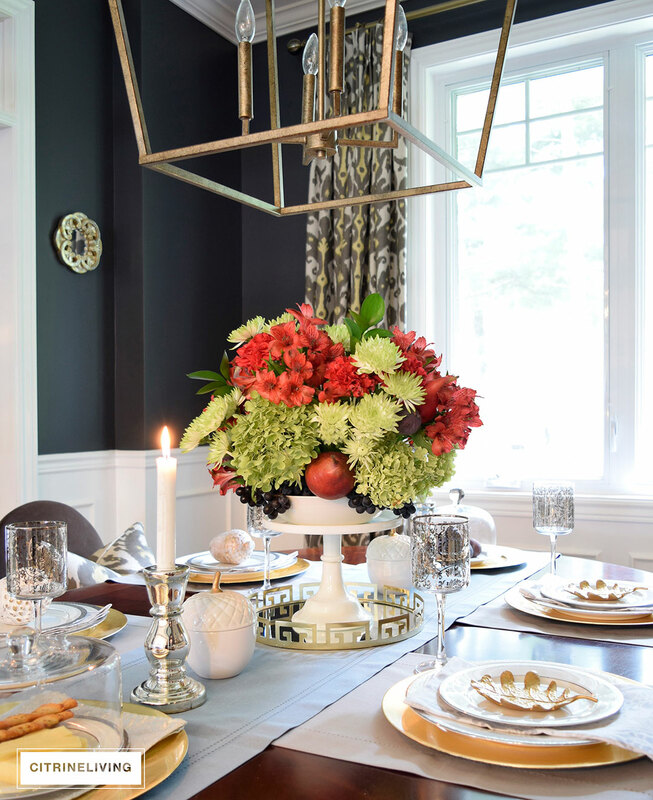 Our dining room can be a tricky space to decorate seasonally, but I always still love to pile it on. Ok, here’s where it started to get tricky. The light on my photoshoot day was horrible. So much so, I had to turn on the lights for some shots, that’s why my dining room is looking a little orange here! I’m also quite new to floral arranging. 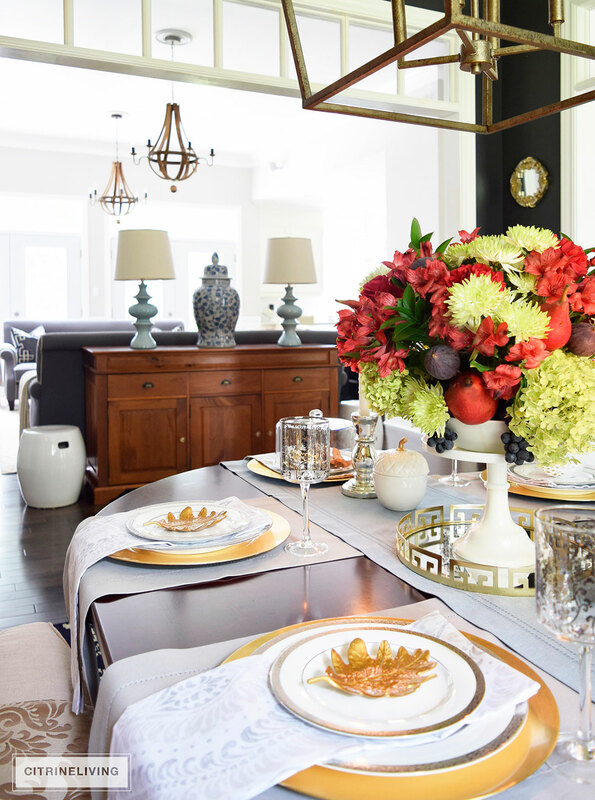 I actually love to use faux flowers, and I use them often, throughout the year. I decided to take a stab at my skills to see what I could come up with and since the seasonal theme here is color, I wanted something to balance out my red lamp. I went to the grocery store to see what I could find, and I came up with this color combination of red, green and deep purple. I didn’t want it feeling too much like Christmas, so I decided to add some figs (the color is amazing, don’t you think?) and grapes, as well as red pears to fill in the holes. I could have used a few more, I think! 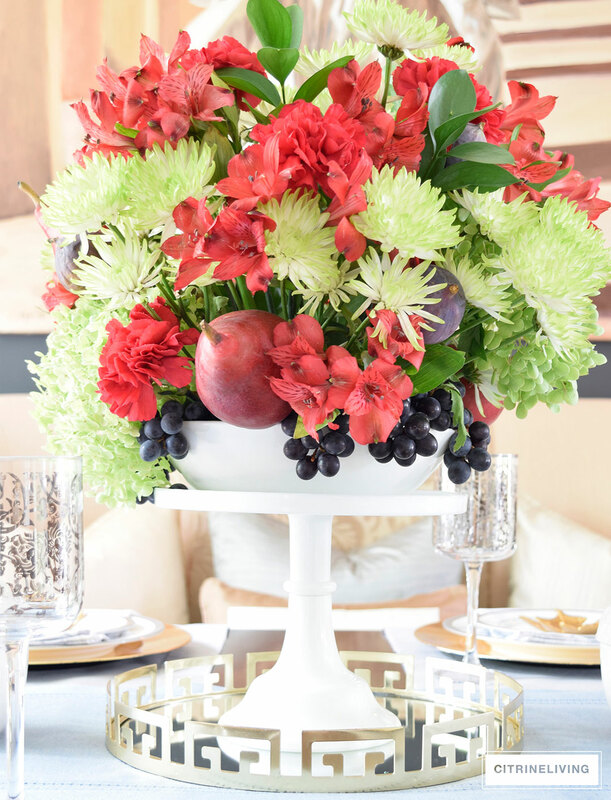 I quickly learned that those pears are very heavy, after my arrangement fell over a couple of times…clearly a rooky mistake! 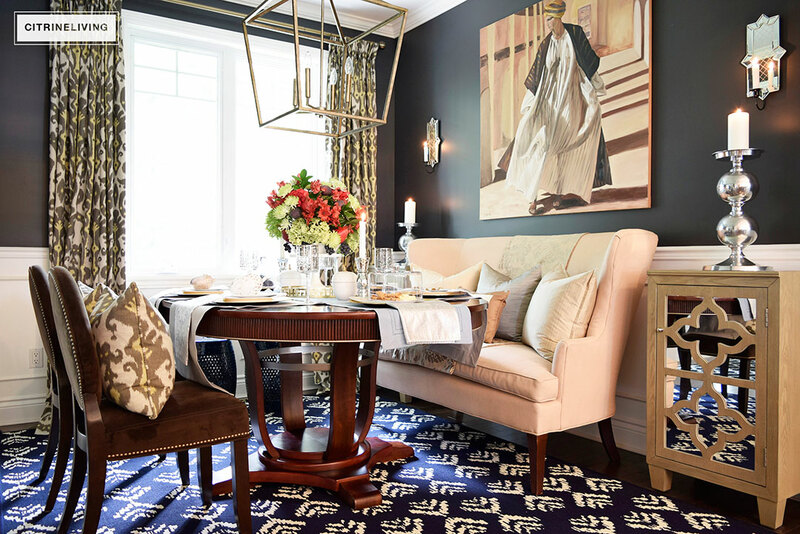 Blue is a consistent color in our decor, so I wanted a touch of it on the table as wel. I layered 3 runners in grey and soft blue as the base of my tablescapte. I originally had light blue hydrangeas in this arrangement, to pick up on the blues, but they wilted so fast, I had to replace them with these green ones from our yard. It turned out even better like this in the end. 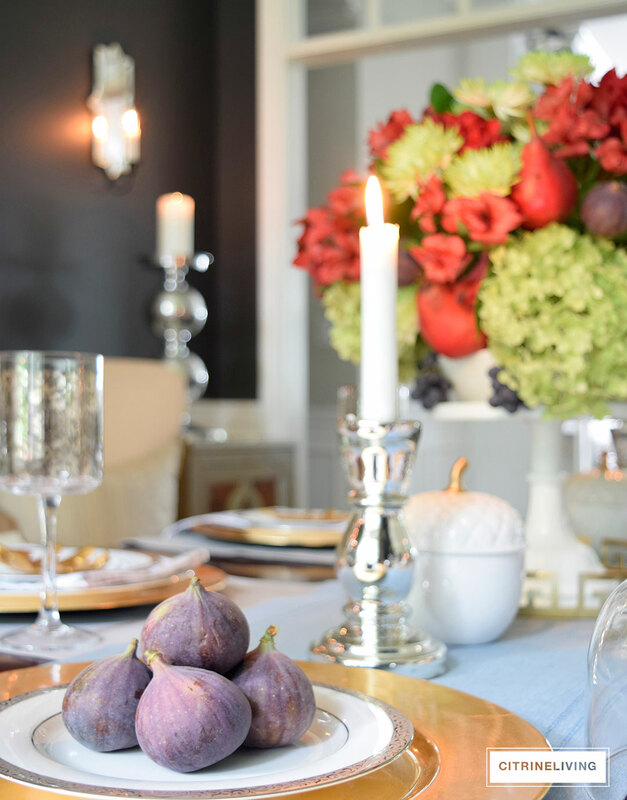 These figs are so beautiful, the color and subtle texture of the skin is a perfect Fall touch and they add so much richness to the table. 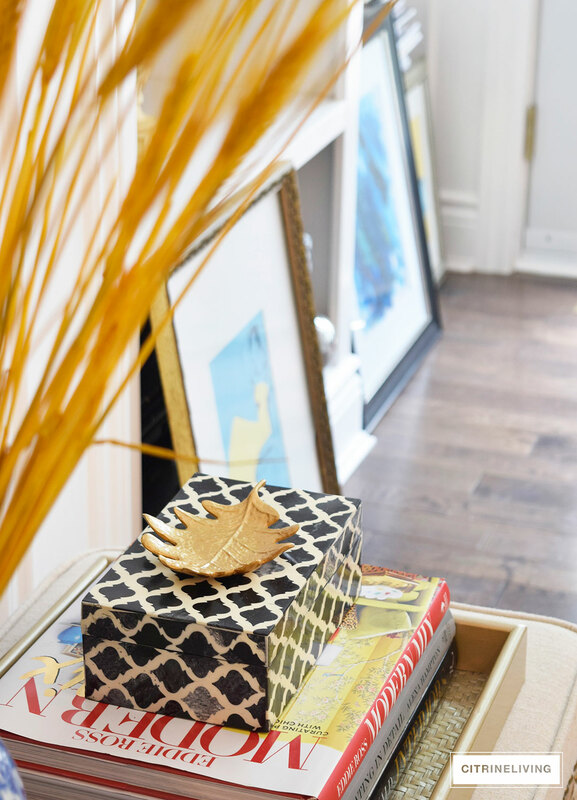 I recently found two of these greek key inspired trays and I absolutely adore them. 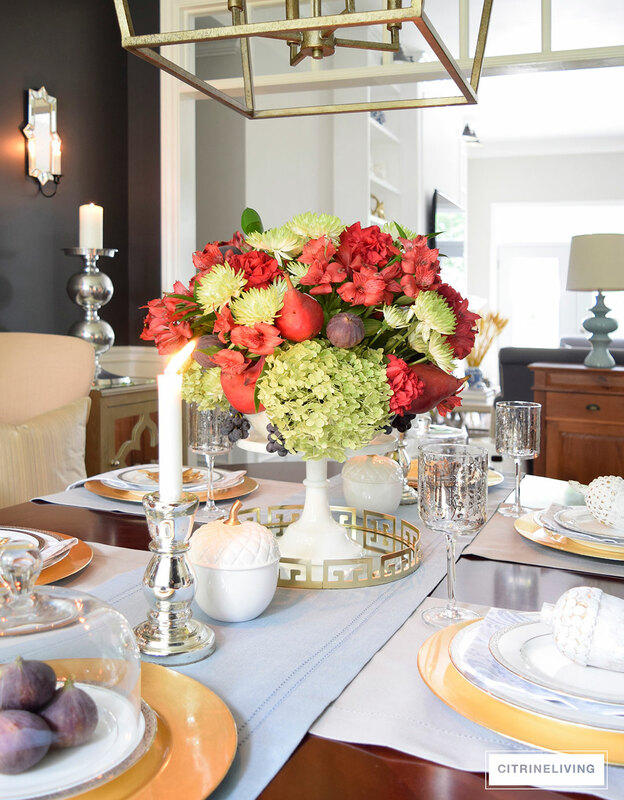 Mirrors and trays are fantastic as a base for any centrepiece. 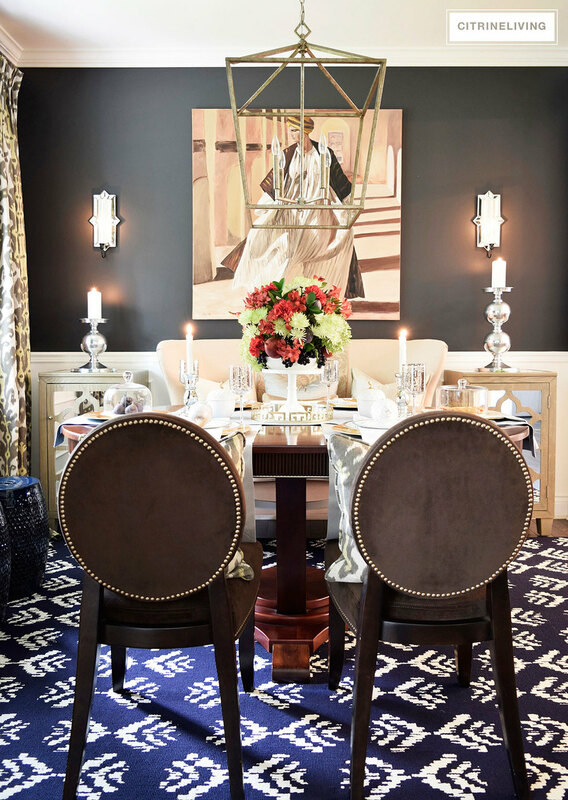 You can find more of my tablescapes and how I style them differently here. Next is our living room, the center of our home. It’s visible from each space and I have more pattern happening in here as well. We recently added full height bookshelves in this room, which you can see here if you haven’t yet. They make a huge impact and will be so fun t decorate throughout the season. I didn’t change them for Fall however, I kept them the same and decided to move a few things around on the ottoman and stools. Getting back to that theme of color and texture, I wanted to add some layers of richness. I replaced all of our pillows with a mix of dark grey, cream and navy in lux velvets and crewel work. 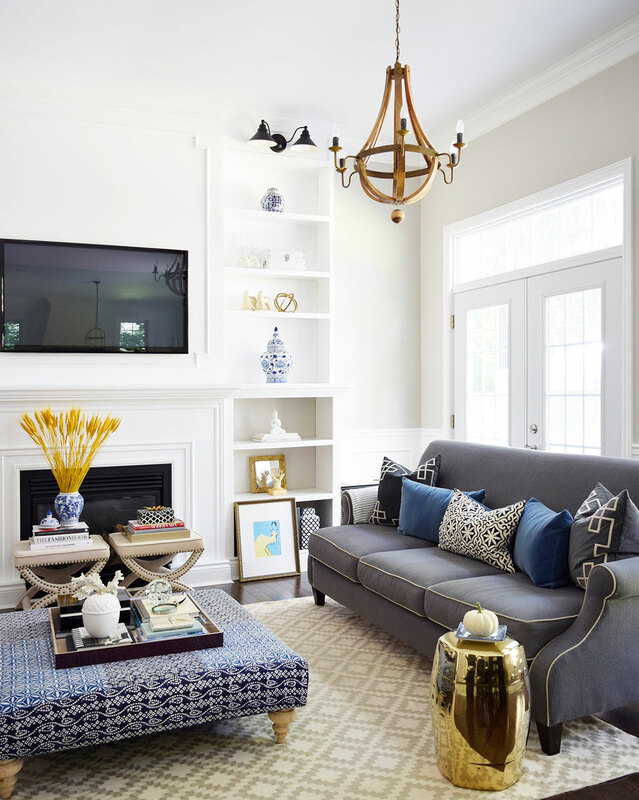 Before, our pillows had a slightly more boho|global vibe going on (see it here) and I wanted to bring in a little more sophistication to the space. 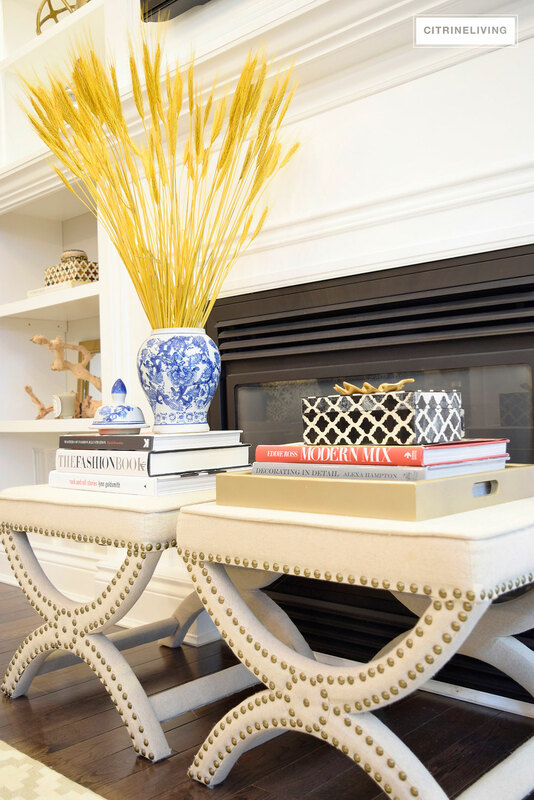 Playing off of my blues, I added some yellow-gold coloured decorative wheat as a strong focal point against the booshelves, to draw your eye in, and to enhance the gold tones already in the space. I just love how vibrant the color is in my ginger jar. 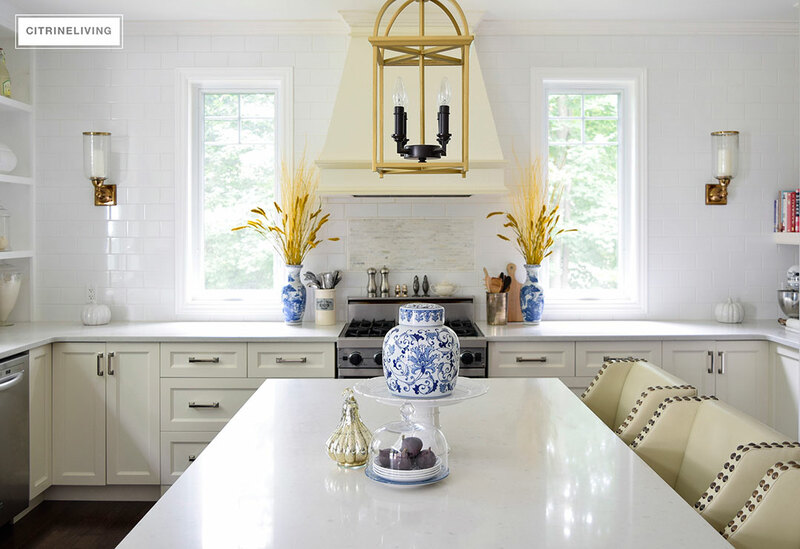 You can get a real sense of the richness these pillows bring to the space. 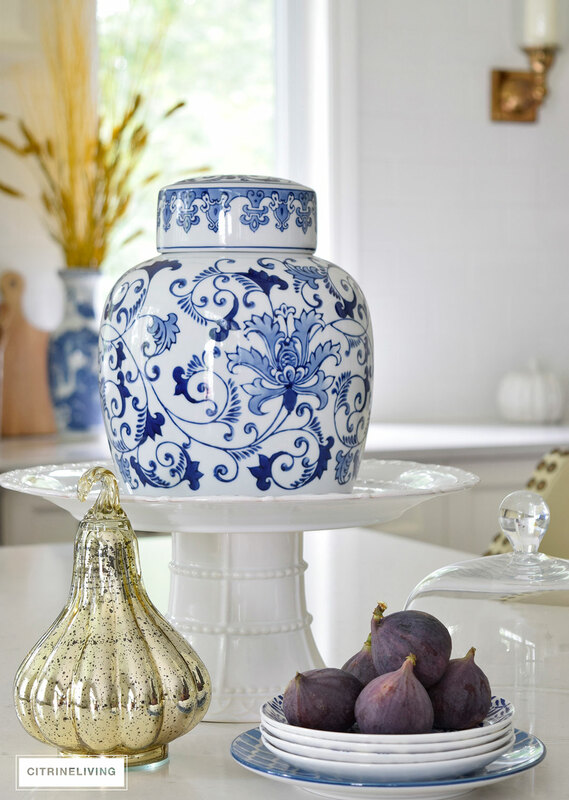 A small white pumpkin is perfect for this blue and white dish and is also the perfect balance with this color palette. 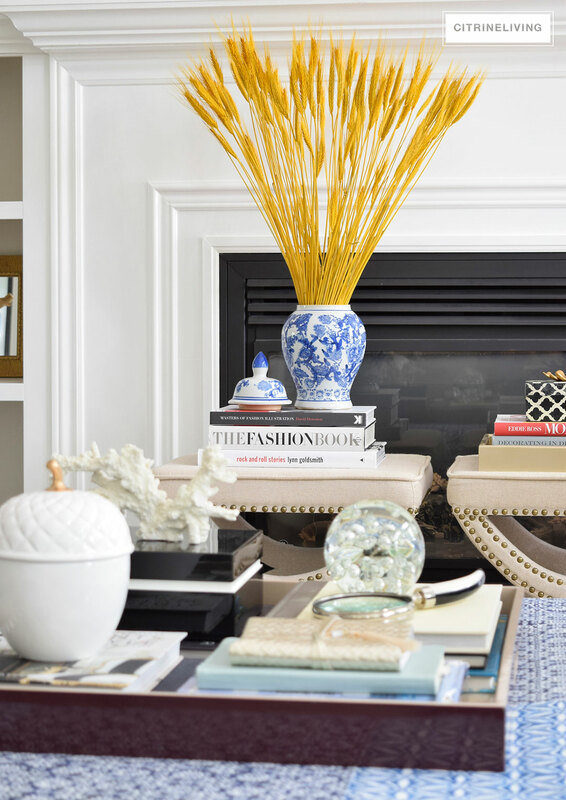 I love my books and using them to infuse color is another great way to layer a certain look or feeling into a space. Other than the pillows, not much in this room is new for Fall. 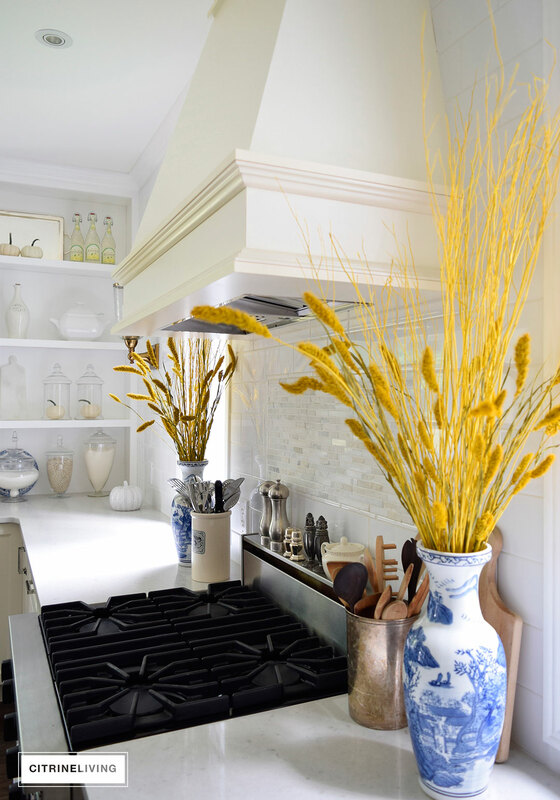 I added just a few simple touches of the season to warm it up – the wheat and a few small accessories go a long way. 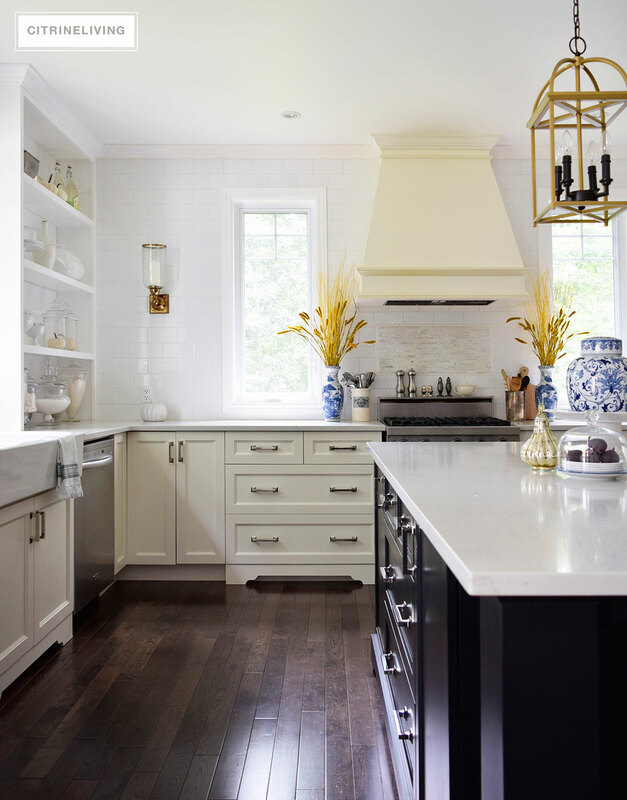 Last stop is the kitchen, where the theme continues and where I have more ginger jars as well. 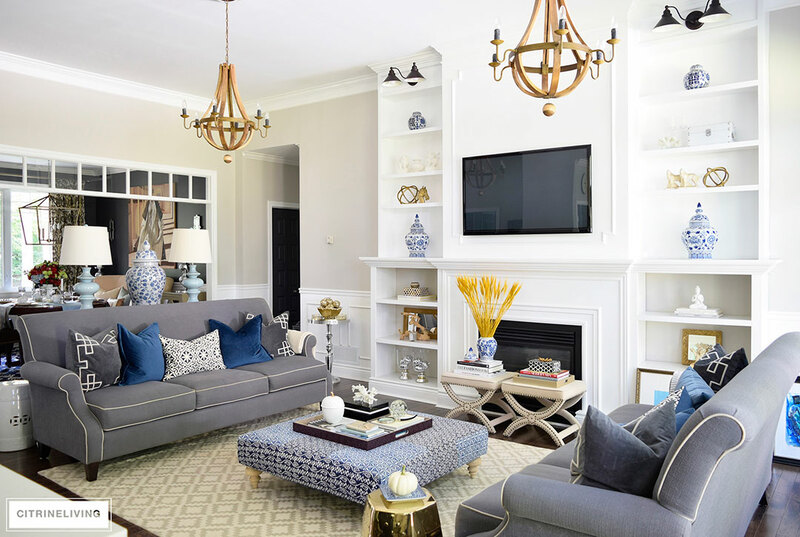 I love my blue and white collection (which is continuously growing), and I hate to have to take it down, just to decorate for the season. I like to try and incorporate it and find ways to work with it. 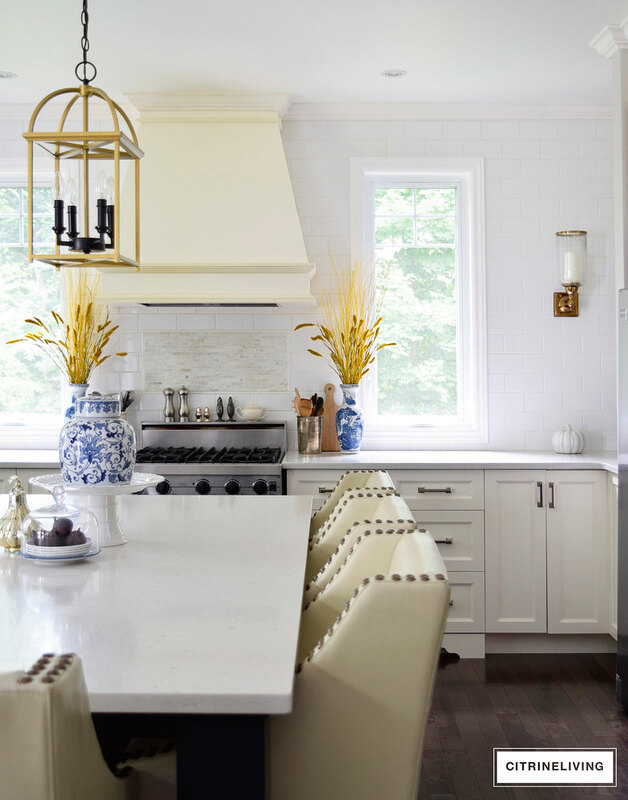 You can see more of how I decorate with this classic beauty here. 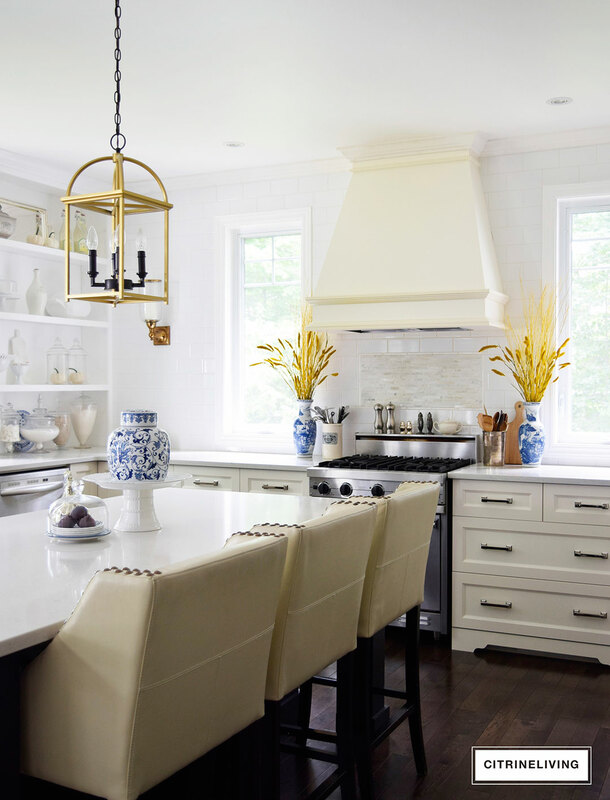 The kitchen is open to, and faces the living room. Again, since there’s plenty of gold tones in this space, I used more yellow to play off of them. 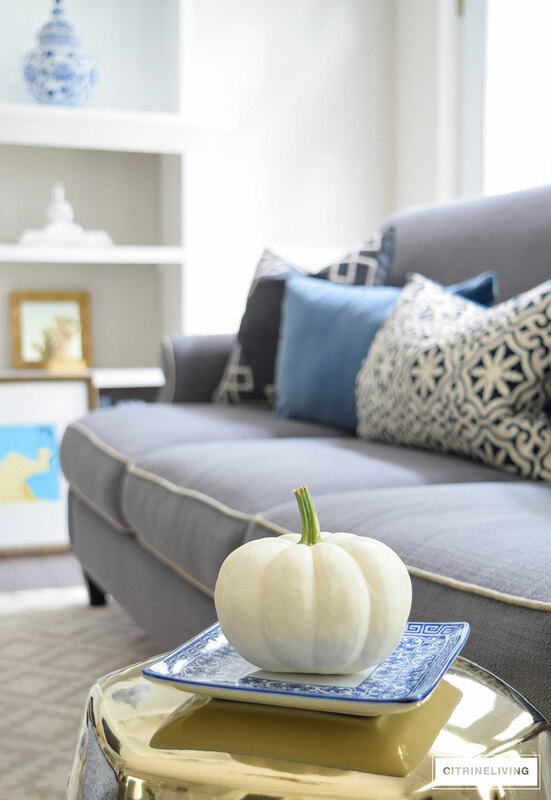 A few small white pumpkins, some ceramic and some real, add another subtle layer of the season. 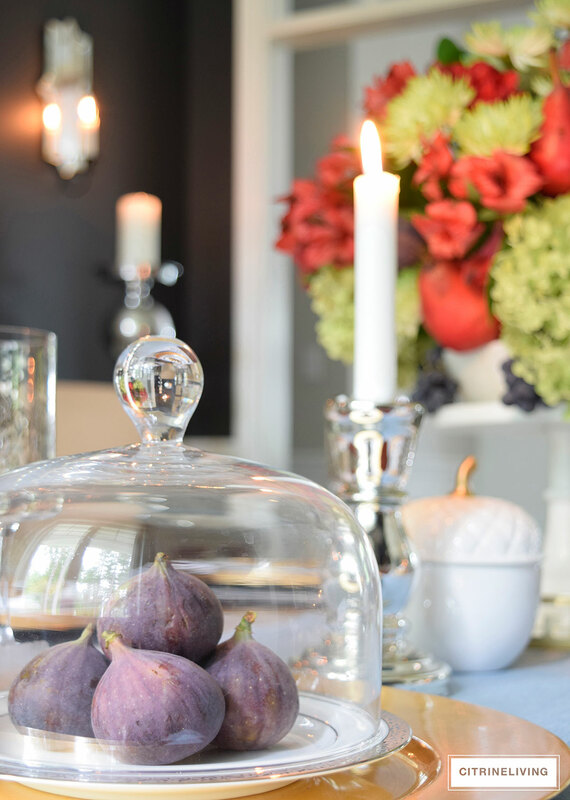 I can’t get enough of these fresh figs and how pretty they are anywhere I add them. 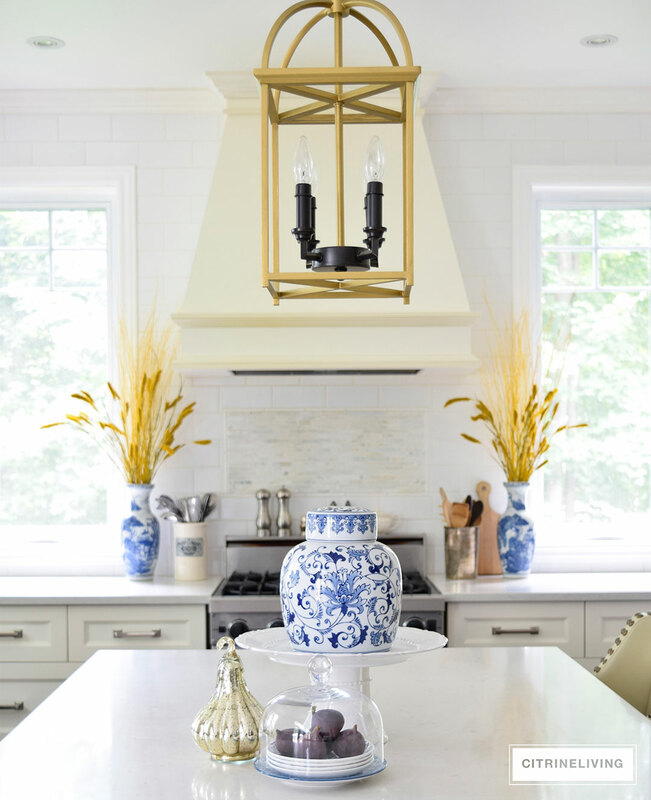 I’m especially loving them layered in here with the blues and gold tones. 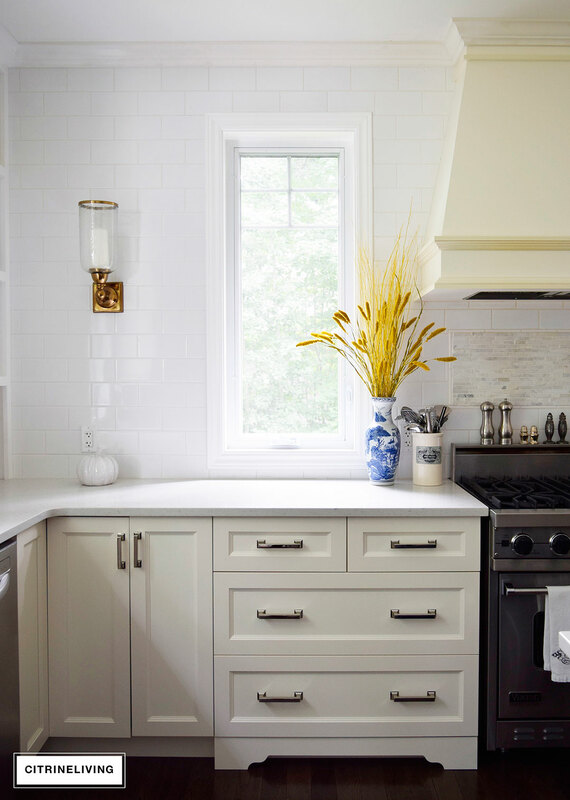 Against the white subway tile wall, it’s such a crisp color palette. 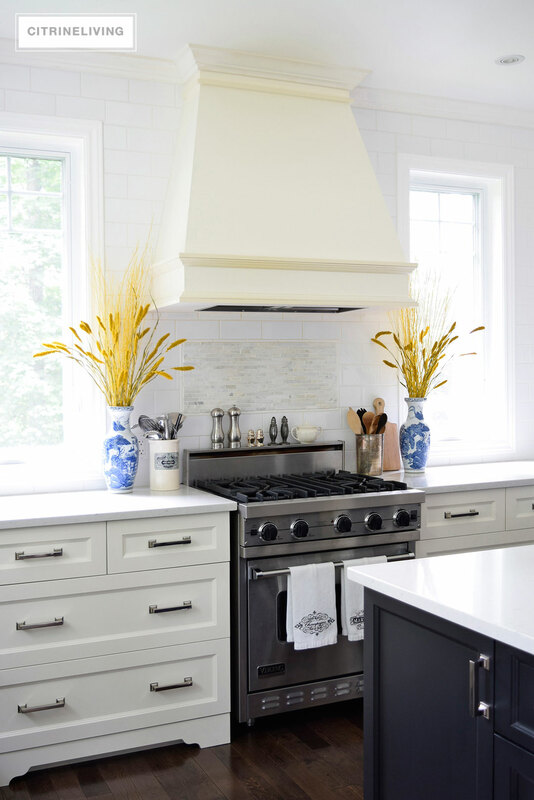 You can catch a glimpse of more white pumpkins up there on our built-in shelf. This too, is a recent addition in our home. 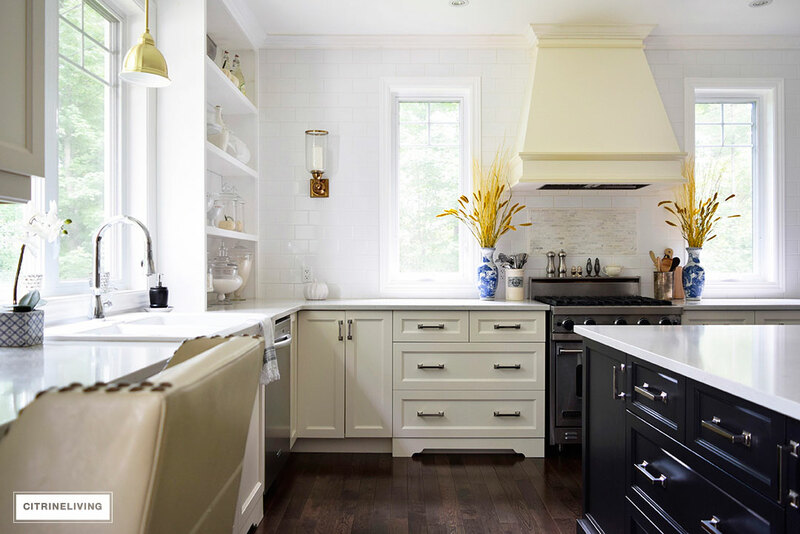 You can read all about it here and see the before of our kitchen if you never have. 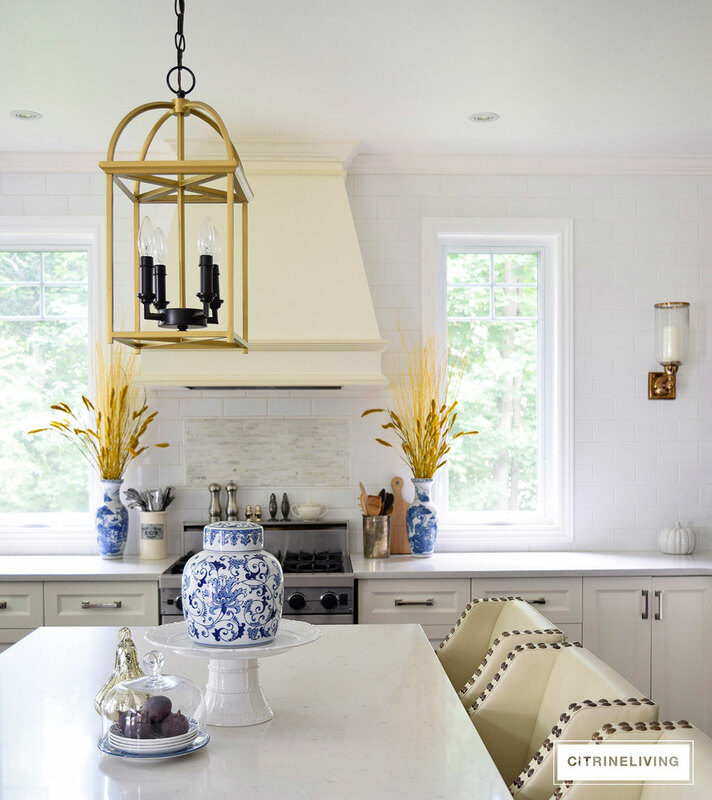 I love how the yellow and blue catch the daylight in front of the windows. It reminds me of being outside in the crisp Fall air. Please make sure to visit everyone else in this incredible lineup if you haven’t yet!